Many Des Moines metro area residents turn on the tap without thinking about where their water came from, how it got there and who made it safe to drink. Whether you are 8 or 98 or anywhere in between, it is important to understand the multi-barrier approach that provides you with a vital public health product. Travel along the Des Moines Water Works’ water treatment process in a two-part video series that explains the many steps taken from river to tap, and the importance to Think Downstream. To view the videos, visit www.dmww.com/education/education-resources/video. During 2015, Des Moines Water Works operated the Nitrate Removal Facility for a record-setting 177 days, eclipsing the previous record of 106 days set in 1999. The Nitrate Removal Facility is used to reduce source water nitrate concentrations to below 10 mg/L, a level established by the United States Environmental Protection Agency (EPA), for our 500,000 central Iowa customers. Des Moines Water Works has been working with a consultant to evaluate nitrate trends in the raw water sources. These trends indicate that nitrate concentrations will continually increase without regulation upstream, reaching levels where the existing Nitrate Removal Facility will be unable to provide sufficient removal to meet the EPA’s drinking water standards. In an attempt to evaluate alternative nitrate removal technologies, Des Moines Water Works is constructing a pilot wetland in 2016. This pilot project will be a one acre surface flow wetland located in Water Works Park. The pilot will be used to test the efficiency of nitrate removal through natural processes. Testing of the pilot will help staff understand how a full scale wetland would react to changes in temperature and flood events, along with any other water quality concerns. In late April, DMWW staff planted 20,000 cattails and bulrush plants in the pilot wetland area. If successful, Des Moines Water Works will consider converting a large portion (up to 80-acres) of Water Works Park into constructed wetlands, with the goal of providing natural denitrification, and ultimately protecting the health of our customers. The consultant is also recommending several nitrate removal measures, including expansion of the current ion exchange denitrification facility. The funds needed for nitrate mitigation in the recently announced five year capital improvement plan total $70 million. An additional $10 million will be needed beyond the five year outlook, for a total of $80 million in infrastructure investments in order to meet the safe drinking water standard for nitrate. What do I Need to Know about the Risks of Lead in Drinking Water? Generally, finished drinking water contains no lead. Lead may be present in piping and plumbing fixtures found in customers’ homes. If drinking water is corrosive, it can corrode customers’ lead service lines and plumbing fixtures, which can result in elevated lead levels in drinking water. Homes constructed before 1950 may be served by a lead water service line. Copper pipe installed before 1985 may have been installed using lead-containing solder. To see if your property is in a Des Moines or Polk County neighborhood that has the greatest potential for a lead service line, view the Potential Lead Service Lines in Des Moines map. Customers who drink water with elevated lead levels can suffer long term health impacts including damage to the liver, kidneys, or even the brain. Mental development issues are a significant concern for children exposed to lead contamination. In 1991, the Environmental Protection Agency published a regulation to control lead and copper in drinking water. The rule is part of the Safe Water Drinking Act, and it requires water systems to monitor drinking water at customer taps. If lead concentrations exceed the Action Level of 0.015 mg/L (or 15 parts per billion) in more than 10 percent of taps, the system must complete additional actions to control the corrosion. What is Des Moines Water Works doing to control elevated lead levels? Des Moines Water Works treats the drinking water to ensure it is not corrosive. Corrosion control is an important part of Des Moines Water Works’ treatment process. By carefully managing the chemistry of our drinking water, Des Moines Water Works ensures the water is not corrosive. A number of factors impact how corrosive treated drinking water will be. These factors include the total amount of dissolved minerals in the water (calcium and magnesium), alkalinity, temperature, and pH. Each day, samples are analyzed to ensure Des Moines Water Works’ treatment for corrosion control remains effective. Could what happened in Flint, Michigan happen in Des Moines? Des Moines Water Works is paying close attention to what unfolded in Flint, Michigan. In North America, no one should have to question the safety of water at the tap. Flint underscores that Des Moines Water Works’ first job is to protect the families we serve. Those of us involved in managing, cleaning and delivering water share an obligation to protect public health. We do not have first-hand knowledge about what occurred in Flint, but this much seems clear: When Flint switched its water supply source, the new water caused lead to leach from service lines and home plumbing – lead that ended up in water coming out of the taps. This kind of incident is unlikely here because Des Moines Water Works monitors water quality parameters on a daily or even hourly basis to ensure the drinking water we produce will not be corrosive. Des Moines Water Works also follows a written Lead and Copper Sampling Plan. This plan helps ensure we stay in compliance with the requirements of the Lead and Copper Rule. Des Moines Water Works tests for lead and copper contamination by asking customers with specific types of plumbing to collect samples in their homes. These results are published annually in Des Moines Water Works’ Consumer Confidence Report, which describes the regulatory requirements Des Moines Water Works must meet or exceed. Des Moines Water Works continues to be in compliance with Lead and Copper Rule requirements. Supplying approximately 500,000 central Iowans with safe, affordable and abundant drinking water is Des Moines Water Works’ mission. Water plays a key role in your health and Des Moines Water Works plays a key role in providing water you can trust for life. What can you do to limit exposure to elevated levels of lead? Use only water from the cold tap for drinking, cooking, or preparing baby formula. Flush the tap for two to four minutes before using water for drinking or cooking when no water has been used for several hours. Showering, washing dishes, or doing laundry can be effective ways to flush household plumbing before water is used for drinking or cooking. While in-home water treatment devices such as softeners or filtration systems are not necessary in Des Moines, if such in-home treatment devices are used, they must be properly operated and maintained in accordance with the manufacturer’s recommendations. Improperly operated in-home treatment devices can increase the potential for water to become corrosive. If you are concerned about lead in your water, you may wish to have your water tested. Please contact Des Moines Water Works at 283-8700 to learn if you are eligible for a complimentary lead test. If you are not eligible for a free test but still wish to have your water tested, a $18 fee will apply. Visit EPA’s lead information website: http://www.epa.gov/lead/protect-your-family#homeleadsafe. This Earth Day, as nitrate concentrations in the Des Moines and Raccoon Rivers continue to rise, Des Moines Water Works reflects on the vast resources spent to manage the persistent agrotoxins in the waters of the state. The natural denitrification strategies include Water Works Park ponds, former gravel pits near Des Moines Water Works’ L.D. McMullen Water Treatment Plant, and most recently, a constructed wetland pilot project in Water Works Park. If the one-acre pilot wetland is successful, Des Moines Water Works will consider converting a large portion (up to 80-acres) of Water Works Park into constructed wetlands, with the goal of providing natural denitrification, and ultimately protecting the health of our customers. In this natural process, nitrate is consumed and converted to nitrogen gas by the life processes of microorganisms. Although the ultimate source of water is the Raccoon River, this approach maximizes the time the water is in off-river storage and allows the nitrate concentration in the river water to be reduced via biological reduction. To avoid high nitrate water in a particular source water, Des Moines Water Works has also invested capital funds for projects that provide access to water with very little nitrate levels – Aquifer Storage and Recovery (ASR) wells – or water with lower nitrate concentration – Des Moines River – that can be blended with other water sources in order to meet drinking water quality standards. Des Moines Water Works’ two ASR wells (a third one is currently being constructed) store finished water in wells for distribution to customers at a later date. Although originally developed to smooth out spikes in treatment demand during high customer demand periods, the ASR wells have been utilized to meet customer demand during high nitrate levels. The Des Moines River Intake facility was constructed to provide additional raw water supply for the Fleur Drive Water Treatment Plant. With the Saylorville Reservoir upstream from the intake, the nitrate concentration in the Des Moines River is almost always lower than the Raccoon River. Access to the Des Moines River provides Des Moines Water Works with another lower nitrate water supply option that was not available prior to construction of this facility. Des Moines Water Works’ newest treatment plant – Saylorville Water Treatment Plant – uses reverse osmosis membranes that removes nitrate from the water, without the use of a side-stream nitrate removal facility. 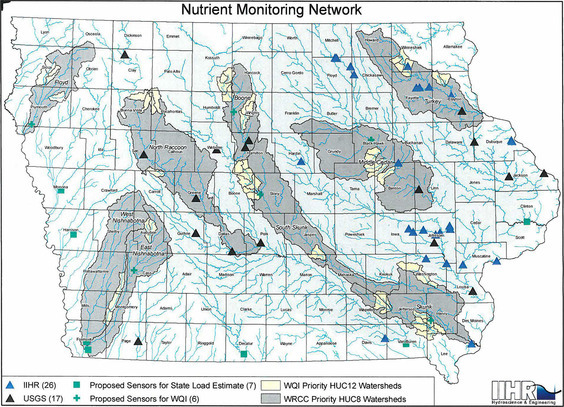 Ultimately, the best way to reduce nitrate concentration in the Des Moines and Raccoon Rivers is nutrient management on farms and watershed protection to prevent agrotoxins from directly entering surface waters. Des Moines Water Works follows this concept by practicing agricultural best management practices on 100 acres of leased farm land on Maffitt Reservoir property, including the use of cover crops and adjusted rental rates for the tenant to install conservation practices. Des Moines Water Works remains vigilant in protecting the source waters that produce drinking water for central Iowans. On this Earth Day and every day, Des Moines Water Work is committed to producing water you can trust for life, even with adverse water quality conditions. 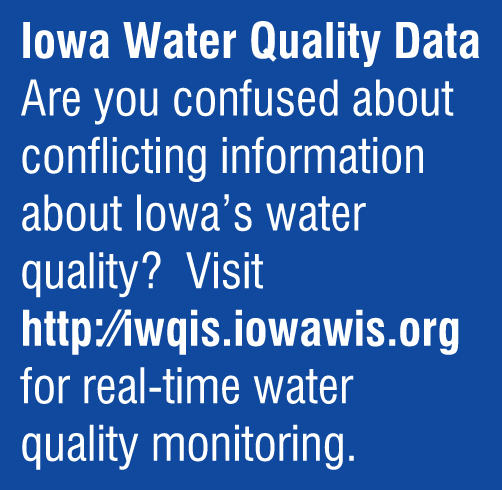 Des Moines Water Works asks all Iowans to Think Downstream. A major conduit of nitrate pollution in the Raccoon River watershed is the artificial subsurface drainage system infrastructure, such as those created and managed by drainage districts. Des Moines Water Works recently filed a federal complaint against the Boards of Supervisors of Sac County, Buena Vista County, and Calhoun County, in their capacities as trustees of 10 drainage districts, for the discharge of nitrate pollutants into the Raccoon River. Why is Nitrate Pollution a Problem? Des Moines Water Works’ mission is to provide safe, abundant and affordable water to our customers. While Des Moines Water Works has invested millions of dollars in capital infrastructure and has developed strategies to manage high nitrate levels, record nitrate peaks in source waters have threatened and continue to threaten the security of the water supply and the ability of Des Moines Water Works to deliver safe and reliable water, while operating with fiscal discipline. The current denitrification technology is outdated and cannot continue to operate with rising nitrate levels and increased customer demand. Continued high nitrate concentrations will require future capital investments of $76-183 million to remove the pollutant and provide safe drinking water to a growing central Iowa. Des Moines Water Works filed a complaint in Federal District Court – Northern District of Iowa, Western Division, on March 16, 2015. The complaint seeks to declare the named drainage districts are “point sources,” not exempt from regulation, and are required to have a permit under federal and Iowa law. The complaint states that the drainage districts have violated and continue to be in violation of the Clean Water Act and Chapter 455B, Code of Iowa, and demands the drainage districts take all necessary actions, including ceasing all discharges of nitrate that are not authorized by an National Pollutant Discharge Elimination System (NPDES) permit. In addition, damages are demanded to Des Moines Waters to compensate for the harm caused by the drainage districts unlawful discharge of nitrate, assess civil penalties, and award litigation costs and reasonable attorney fees to Des Moines Water Works as authorized by law. Des Moines Water Works’ mission is to provide safe, abundant and affordable water to our customers. Des Moines Water Works is fighting for the protection of customers’ right to safe drinking water. Through this legal process, Des Moines Water Works hopes to reduce long-term health risks and unsustainable economic costs to provide safe drinking water to our customers, via permit and regulation of drainage districts as pollutant sources. Continued insistence from state leaders that the voluntary approach of the Iowa Nutrient Reduction Strategy is working does not give solace to the 500,000 central Iowans who must now pay to remove pollution from their drinking water. Why Sac, Buena Vista, and Calhoun Counties? Buena Vista, Calhoun, and Sac Counties are in the Des Moines Lobe. There are hundreds of drainage districts in these three counties. Under Iowa law, drainage districts are responsible for constructing, administering, and maintaining drainage infrastructure. Within each drainage district, a network of pipes and ditches move groundwater and agricultural pollutants quickly into our drinking water sources. Recent water monitoring by Des Moines Water Works at 72 sample sites in Buena Vista, Sac, and Calhoun Counties have shown nitrate levels as high as 39.2 mg/L in groundwater discharged by drainages districts. This is 4 times the federally required Safe Drinking Water regulatory limit of 10 mg/L. Laws require that “point sources” discharging into rivers must have permits under the NPDES. Because drainage districts transport nitrate pollution through a system of channels and pipes, they should be recognized and held accountable like every other “point source” contributor. NPDES permits have been successful nationwide in controlling pollution caused by industrial waste and sanitary sewer discharge. Throughout the year, Des Moines Water Works receives calls from customers who say their tap water appears milky white or cloudy. In the majority of cases, the cloudy water is caused by harmless air bubbles, but sometimes it can indicate a plumbing issue. Fortunately, determining the cause is as simple as filling up a clear glass with water and setting it on the counter. If the water clears from the bottom of the glass to the top, the water has air bubbles. This reaction sometimes occurs when cold water from underground mains enters warmer pipes inside your home. Since cold water holds more dissolved air than warm water, as water warms, air may be released as tiny bubbles when a tap is turned on. The water is safe to drink, the discoloring is just the result of a harmless reaction. If the water in the glass clears from the top-down, and white or grey particles settle to the bottom, this may indicate a water plumbing issue. Call Des Moines Water Works at (515) 283-8700 and staff will assist in diagnosing the problem and provide a list of qualified plumbers. For more information on water quality, visit www.dmww.com/water-quality.